Louis Wolchonok was a social realist painter and member of the Woodstock Art Association. His work was exhibited at the Whitney Museum of American Art, the National Academy of Design and the Philadelphia Academy of Fine Art. He taught at the City College of New York and the Craft Students League from the 1930s until the last year of his life, authoring three books on composition and design. 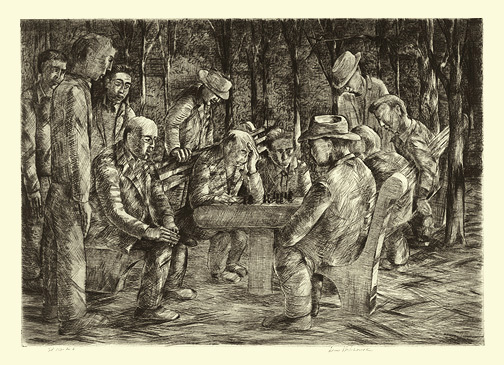 Untitled (Chess in the Park) --- c.1930, Etching. Edition 150. Signed and numbered Ed 150 - No. 6 in pencil. Image size 9 13/16 x 13 7/8 inches (249 x 352 mm); sheet size 12 3/8 x 15 13/16 inches (314 x 402 mm). A fine, rich impression with full margins (15/16 to 1 3/8 inches) on cream wove paper. Small areas of tape residue in the four sheet corners, well away from the image, otherwise in excellent condition. 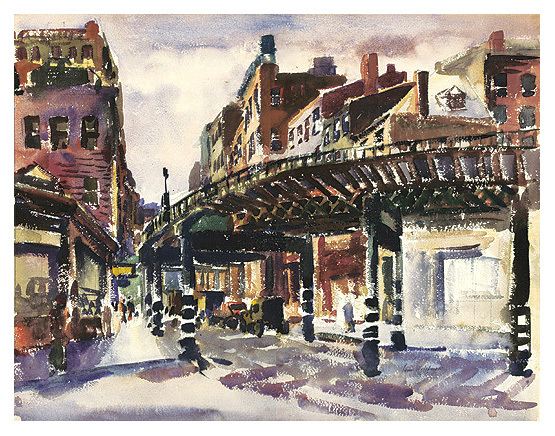 Untitled (Under the El) --- c.1940, Watercolor. Signed in ink, lower right. Image size 18 1/2 x 23 7/8 inches (470 x 606 mm); sheet size 19 1/4 x 24 1/2 inches (489 x 622 mm). A strong, painterly work, with fresh colors, on watercolor paper laid to board, in excellent condition. 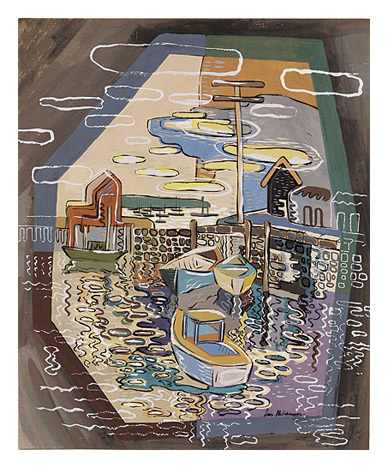 Untitled (Gloucester Harbor) --- c.1950, Gouache. Image size 10 9/16 x 8 5/8 inches (278 x 219 mm), image extends to the sheet edge. A fine, modernist drawing, with fresh colors, on cream wove paper, in excellent condition.